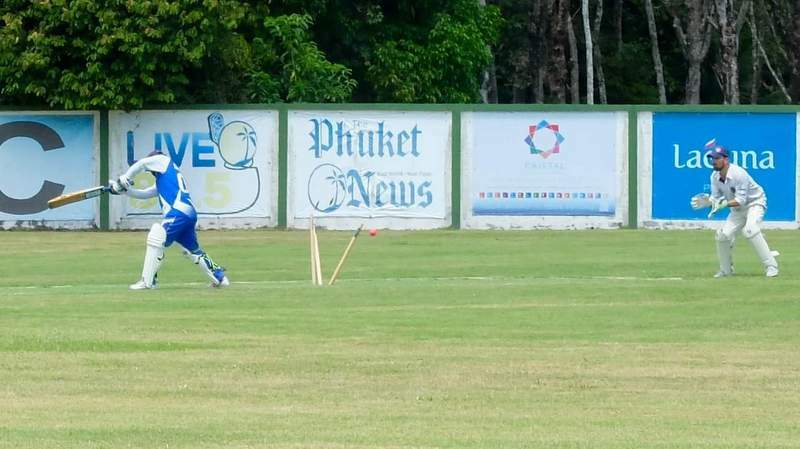 CRICKET: Round one of the ASL sponsored cricket league at the ACG went down to the wire on Sunday (Jan 13) as the newly formed Phuket Misfits went on to beat last season’s runners-up the Goan Panthers with just six balls to spare. Panthers’ captain Balesh Dessai won the toss and chose to bat under cloudless skies at the ACG Cricket and Sports facility in Thalang. The Panthers were hoping to build on a stellar performance in the last league, but knew they would find the going tough against a team of Misfits with a wealth of experience. 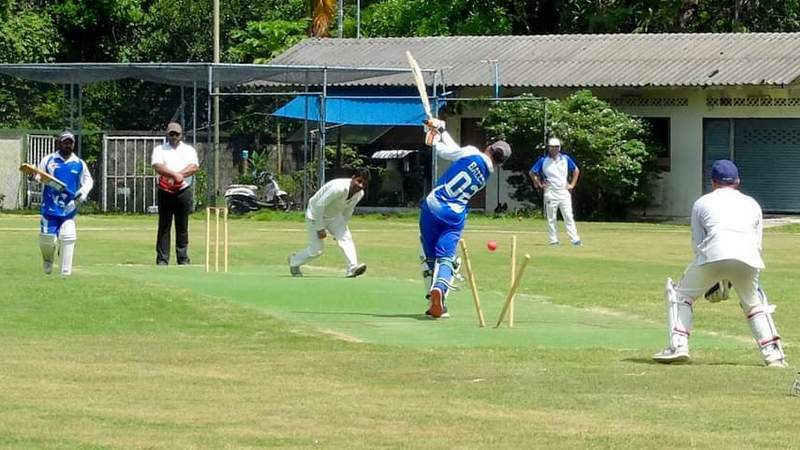 The Misfits comprises some new recruits to cricket on the island along with players from disbanded teams, The Phuket Stars, The Blasters and some Laguna Cricket Club players. They are captained for this league by the every energetic and likeable Mudasir Rehman. V Salikineni and M Deuskar opened the batting for the Panthers and while Salikineni was going along at a run a ball at one end, Deuskar (0) couldn’t find his feet at the other and was soon trapped in front-LBW by Pir Sami. V Salikineni (15) would follow not long after as he was caught by newcomer D Mir off the bowling of captain Rehman. The next three Panthers batsmen, R Naik (39), A Virdikar (19) and G Geetesh (24) would all get starts and keep the scoreboard ticking along but never able to break the shackles to put the Misfits bowlers under any pressure. The Misfits could, however, be encouraged to invest in a compass before their next outing as their bowlers would average more than one wide per over, ending with over 40 runs gifted to the batting side due to ill-discipline. The Panthers would eventually settle for 186 for 9 in their allotted 35 overs. The pick of the Misfits bowlers being P Sami (4 for 44), M Rehman (3 for 25) and the new face on the scene D Mir picking up two wickets on his debut for just 16 runs. The Misfits began the chase by immediately losing their opening batsman, Steve (1), trapped in front-LBW, by A Virdikar. This brought MS Khan to the crease to join the other opening batsman Jeremy Bootsy, and for the next hour the spectators would be blessed with a batting clinic. MS Khan took on the aggressive role and Bootsy anchored the ship, effortlessly feeding the strike to Khan who was dispatching the ball over the boundaries at will. The Misfits moved their score along to 82 before Bootsy (34) would eventually fall, mistiming his trademark pull shot to be caught by R Naik off the bowling of Paresh. When the following partnership of P Evans (8) and MS Khan (67) moved the score on to 125, it seemed as if the game had slipped away from the Panthers. However, some tight bowling and enthusiastic fielding saw the Goan Panthers claw their way back into the game as a precession of wickets saw the Misfits slide dramatically from 125 for 2 to 156 for 6 when captain M Rehman (13) was run out with some excellent fielding by A Virdikar and P Goenker. On this day, however, the Misfits would just have too much batting depth for the Panthers’ bowlers. M Sadarangani (22*) coming in at number 6 batted calmly and seemed the only batsman to realise there was no need for the big shots and that by just keeping the scoreboard ticking over that they would eventually get over the line. They also had the knowledge that still sitting in the sheds padded up was M Ahmed, who on his day is likely the most devastating batsman on the island. M Ahmed would eventually get his turn at the crease, with the game still in the balance with 12 runs needed off the last 12 balls. With eight balls remaining and nine runs to get, Ahmed (12*)would eventually get strike and calmly dispatched the first ball over the perimeter wall and sent the second crashing into the clubhouse to end the game and give the Misfits the win that takes them to the top of the table at this early stage. The pick of the Panthers’ bowlers were A Virdikar, 3 for 32, and Paresh, 2 for 21 off 6 overs. Man of the match was awarded to MS Khan for his brilliant innings of 67 off 65 balls. For more information on all at the ACG, please contact Jason Robertson via jason@acgphuket.com or visit their Facebook pages: Phuket Cricket Group or ACG Cricket and Sports Facility.